The hotel is located on the Douglass Campus and is on the Rutgers bus route. It offers complimentary Wi-Fi, public computer use, printing, snacks and convenience items. 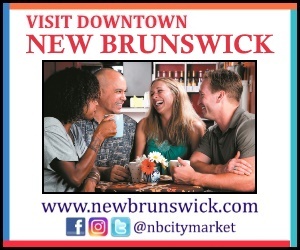 The hotel is located in downtown New Brunswick and is in walking distance to the Rutgers bus route. It offers complimentary 24/7 access to the Hyatt Stay Fit Gym, an indoor pool, and a whirlpool. Enjoy some American Cuisine in the Glass Woods Tavern or Starbucks. Hypo-allergenic rooms are available. The hotel is located in downtown New Brunswick across the street from the State Theatre and is on the Rutgers bus route. It offers complimentary high-speed wireless internet, HBO, and access to the Health Club and indoor pool. Enjoy the food and atmosphere of Christopher’s Restaurant and Christopher’s Lounge. The hotel offers complimentary 24/7 Wi-Fi access, printing, faxing, and access to the fitness center as well as complimentary drinks and appetizers at evening receptions. In the hotel you will find Ellington’s Restaurant. The hotel is a green, eco-friendly establishment with complimentary high-speed, wireless internet access, remote printing capabilities, a heated indoor swimming pool, fitness center, and USA Today® weekday newspaper delivery. Fusions Restaurant and a 24-hour “Corner Store” are available in the hotel. The motel offers complimentary local calls, morning coffee, and expanded cable. Kids stay free and pets are allowed. Wi-Fi is available. The newly renovated hotel offers a 24-hour fitness center, indoor and outdoor pools, business center, and outdoor courtyard. It also has an onsite restaurant and bar. The hotel offers free morning newspaper delivery, high-speed internet access, a health and fitness center, and an outdoor pool. The hotel offers complimentary Wi-Fi, a 24-hour business center, an indoor pool and a fitness center. The hotel offers complimentary hot breakfast, free WiFi, fitness center, guest laundry, and the ability to earn Hilton Honors points for every stay. The hotel offers complimentary access to the fitness center, a heated indoor pool, and a whirlpool. The Café and Sports Edition Bar are located in the hotel. The hotel offers daily complimentary buffet and continental breakfast, morning newspaper, high-speed internet access, a health and fitness center, and an indoor pool.